Today I am experimenting with word verification on this blog. I hate word verification, but weird stuff has been going on with my blog for several days now—a bombardment of automatic spam, most of it advertising Viagra and other drugs. The Blogger spam feature has effectively blocked the comments from appearing, but a constant flood of those kinds of hits can’t be good. They are all from the same IP address that apparently originates from the United States. A few minutes or a few days don’t seem to make a difference. The same message appears. Now I am wondering if all these irritating conditions are related. In July two years ago, we vacated our campsite in the Great Smoky Mountains National Park and headed for an early morning drive on the Blue Ridge Parkway. We stopped in the parking area at the foot of Waterrock Knob. 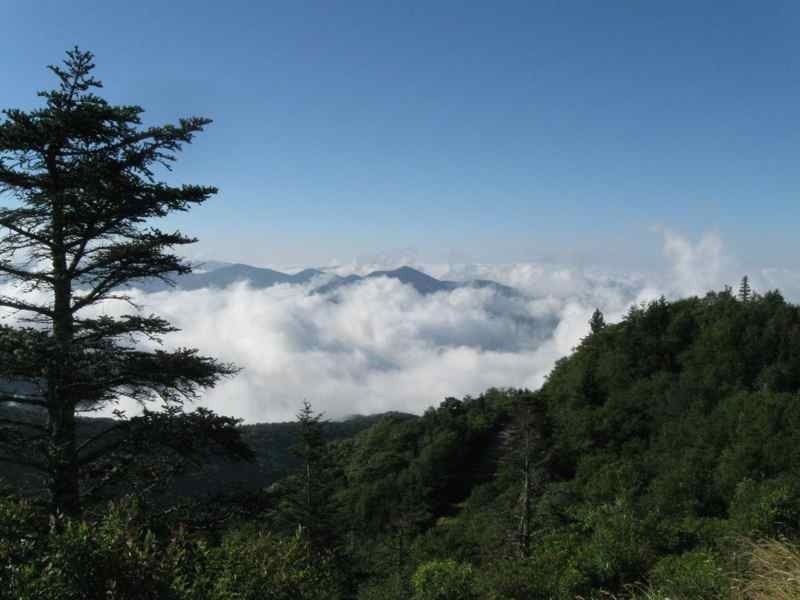 The view of mountains and clouds was framed by several lush evergreens that I assume are eastern hemlocks. Husband Walter pulled out our camping chairs and Coleman stove. In a few minutes he had brewed coffee for himself and hot tea for me. We sat and soaked in the sensory feast of visual splendor, cool breezes on our faces contrasting with the hot liquids we sipped, quiet sighing of gentle wind in the trees and the clean, woodsy smell of our natural surroundings. According to a National Park Service Web site here, eastern hemlock trees are some of the largest and most common trees in the Great Smoky Mountains. Called the "redwood of the east," they cool mountain streams and provide habitat for many other species. They can grow more than 150 feet tall on trunks measuring six feet in diameter. Some hemlocks in the park are more than 500 years old. I haven’t personally visited any of these hemlock “elders,” but I do love the dark green and graceful geometry of healthy hemlocks. Fast forward to July 2012. 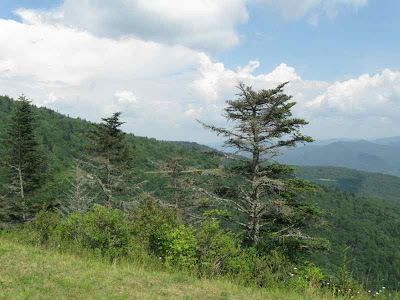 We looked forward to revisiting the Waterrock Knob overlook. How things had changed. The view-framing evergreens were now suffering a slow death, under attack by an alien aphid-like insect, the hemlock woolly adelgid, that entered the United States in the 1920s. 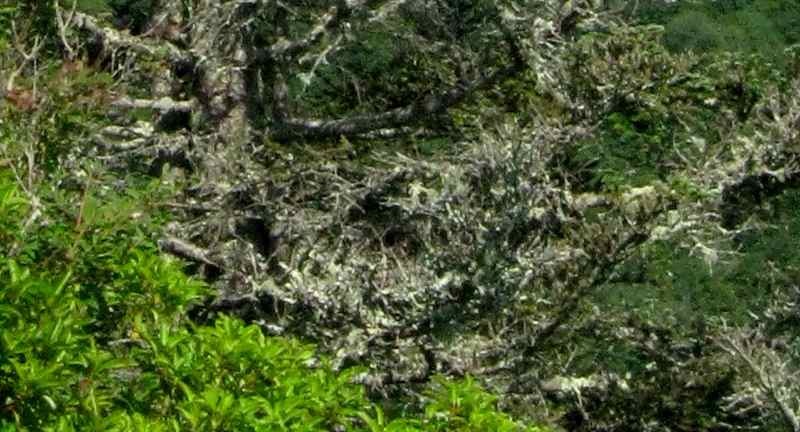 Dying trees and stark, lifeless skeletons are now a common sight in the Great Smoky Mountains National Park where whole sections of the Smokies’ distinctive hemlocks have died. 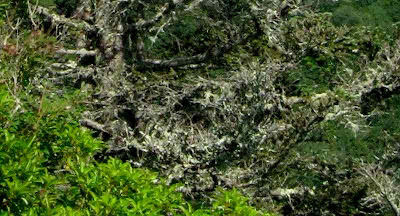 The NPS Web site noted that along the Blue Ridge Parkway and in Shenandoah National Park the wooly adelgid has killed as many as 80 percent of the hemlocks. Some changes make me especially sad. I regularly order a Darjeeling variety of the Mighty Leaf brand of tea at the coffee shop that Hubby and I frequent. But a couple of months ago we experienced a series of what we thought at first were cup malfunctions. Moments after my tea would arrive at our table, tea would puddle around the cup. We finally figured out the culprit. The string between tea bag and tag was wicking tea out of the cup and sending it dripping onto the table. We still don’t know what about the string had changed. But true to his Boy Scout training, Hubby comes prepared. He whips out a tiny pair of scissors and attacks the string. 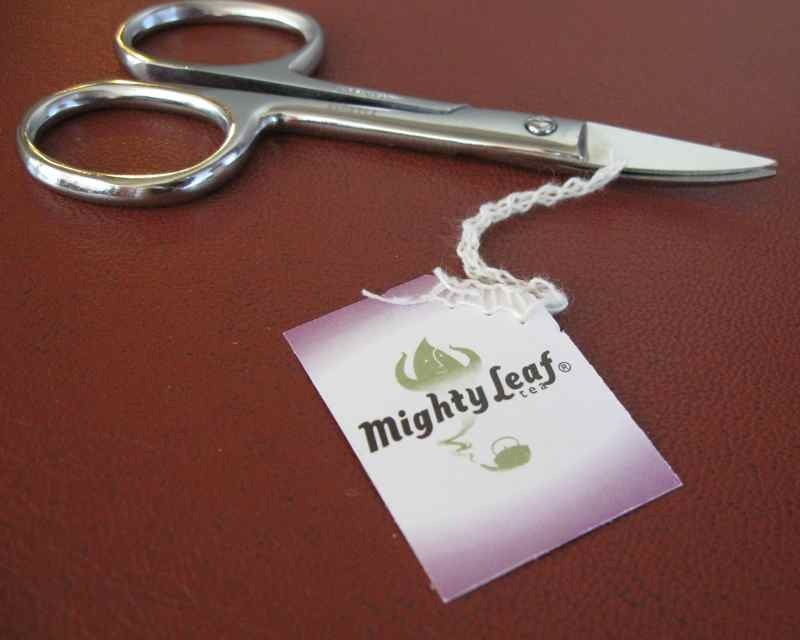 A single snip and the minimal remaining string, still attached to the tea bag, slips back into the cup.